SG-1 travels to Argos where they find a civilization of beautiful happy people who worship the Greek god Pelops and celebrate all day, but mysteriously drop to sleep at dusk. More mysteriously, they age very rapidly. A lifespan is only 100 days. When O'Neill, too, begins to age at an alarming rate, SG-1 discovers the cause. Nanocytes, microscopic robots spread through the bloodstream, were part of Pelops' cruel experiment on the population. The team has only days to find a way to deactivate the nanocytes and prevent their deadly effect on both O'Neill and the Argosians. The god Pelops, a Mycenaean herald, fought from a winged chariot hurling lightning bolts. 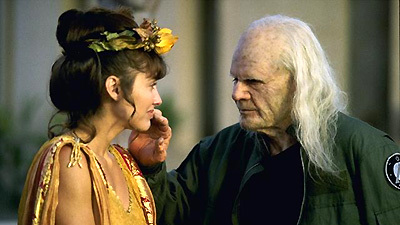 Pelops "The Creator" "The Giver of Days" was a Goa'uld who brought the ancestors of the Chosen to Argos to study human physiology and evolution. The self replicating mechanical nano-virus is spread through bodily contact. When triggered by a transmitter signal, it accelerates the life span approximately 250 times (1 day = 1 year). Without the transmitter signal, the immune system destroys the virus. Thetys is 21 days old, Kynthia 31 days, O'Neill gives his age as 40, and accelerates to the equivalent of 90 years, but recovers in 1-2 weeks. Goa'uld tablet and page turning device contains writing resembling linear "A" script pictographs found in ancient Greece and Cretan. Daniel learned midwifery on a dig in the Yucatan and has delivered 2 babies. Carter studied nano-technology for a year at the Pentagon. The cure could be as simple as just getting the hell out of Dodge.